On Friday (9th Nov) the West Midlands Combined Authority (WMCA) Board will meet, and sign off on the plan on how to spend the £250 million from the Transforming Cities Fund (TCF) that the West Midlands was awarded in spring 2018. The Secretary of State's letter to Andy Street, the West Midlands' mayor, said that this fund was intended to focus on "improving public and sustainable transport, helping to reduce congestion and improve air quality". Last year, when the fund was announced, we called for the West Midlands Combined Authority to dedicate at least 10% - £25 million - of that money to cycling. We were both blindly optimistic, and also woefully unambitious with our ask: On Friday, the WMCA Board will agree to spend just £6 million on cycling (over 4 years), while in Greater Manchester, Andy Burnham has allocated £160 million from their TCF money to cycling. The agenda for Friday's meeting can be found here: WMCA Board 9th November Agenda (Page 110 has the spending figures). For some comparison, £207 million is being spent on the tram from Brierley Hill to Wednesbury, £10 million on a new bus station for Dudley, £7.4 million on Birchley Island in Sandwell, £5.8 million on the B4106 Spon End in Coventry and £5 million on the public realm in the centre of Birmingham. It is not specified where the £6 million for cycling will be spent, but with about 5.7 million people living in the West Midlands, that is 25p for each of us over the 4 years of this funding programme. With only another £9.75 per person per year (or about £55 million per year) WMCA could reach the minimum spend of £10 per person that their Cycling Charter recommends. Note that 25p is the average yearly spend per person that the West Midlands has had in the past, according to the Cycling Charter. Of course, investing in public transport is a good thing, and the tram is more energy efficient to run than buses (although the embedded energy in the tram tracks is perhaps greater). But is investing £207 million in a tram line, and £6 million in cycling a good way to spend money? Perhaps not. Agenda item 11, WMCA's "Strategic Vision for Bus" puts forward the argument for spending money on buses rather than trams. Inside, we find out that buses were 81% of all public transport use in 2016/17, while rail was 17% and the Metro was only 2%. Notably, buses have a modal share of 8% of all journeys, while cycles have 1%, and rail and metro combined have 1% too. 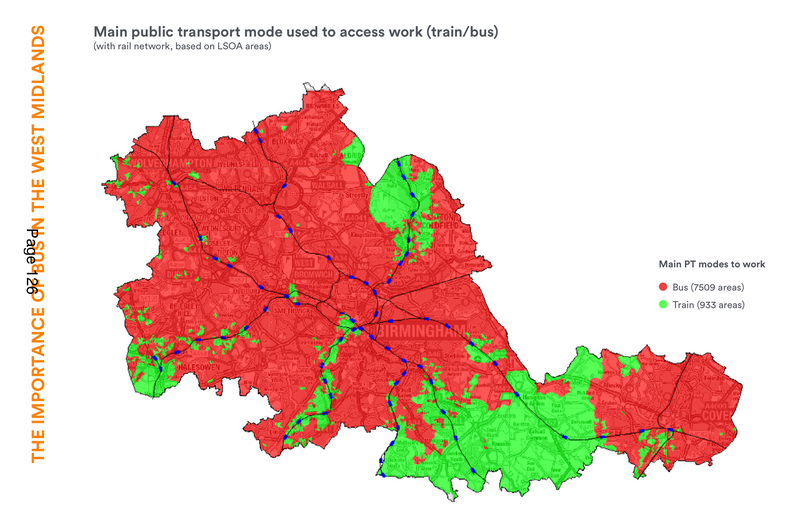 That's right - more people in the West Midlands cycle than ride the Metro (On the map of main public transport mode below, the Metro is not even put on the map, as its level of use is so low). In fact, looking at the ratio of rail to Metro use, we can see that there are about 900% more people cycling than taking the Metro, yet cycling will only receive 3% of the money that will be spent on Metro from the Transforming Cities Fund. The WMCA Congestion Management Plan says that one of the things you can do personally to help reduce congestion is leave your car at home. Public transport might be a good choice, and also for shorter trips, "walking or cycling could be the fastest route to your destination." Of course, 41% of all car journeys are under 2 miles, so if cycling replaced only half of those very short journeys, the modal share for cycling would be about 14% of all journeys - or more than bus, rail and metro combined. Spending that £207 million on a combination of Low Traffic Neighbourhoods and strategic main road cycle routes, would result in a far bigger reduction of congestion than the tram line from Brierley Hill to Wednesbury. When will the West Midlands start properly funding cycling projects? The Bike Life 2017 report found that 70%+ of the British population (not just people who cycle) want to see more money spending on cycling, but it seems that the WMCA Board hasn't heard that message yet. 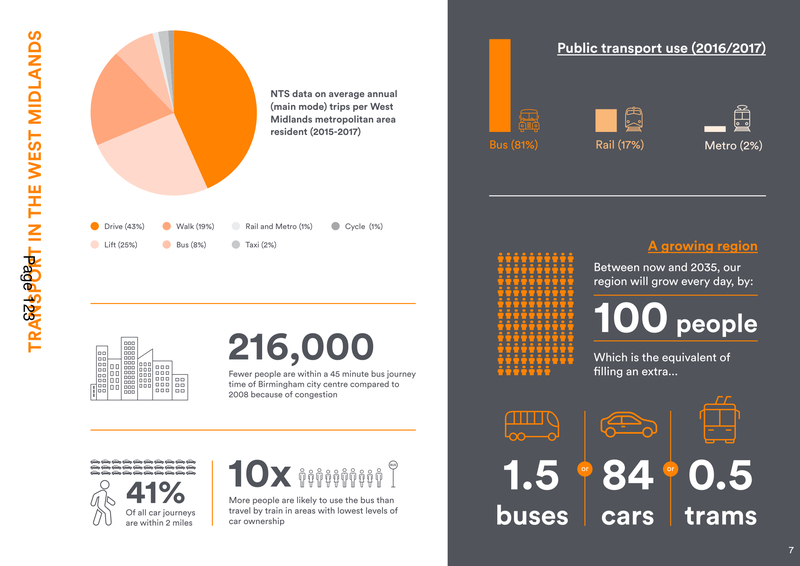 Transport statistics for the West Midlands from the 'Strategic Vision for Bus' draft document going to the WMCA Board for approval on Friday 9th November. From the WMCA "Strategic Vision for Bus" draft document going for approval on Friday 9th November. Note that the level of Metro use is so low that it has been omitted from this map completely. 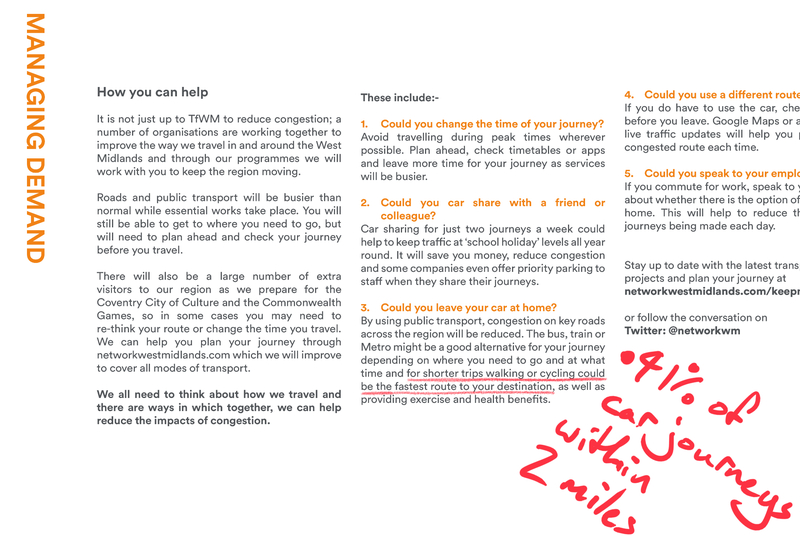 Advice on what measures you can take to reduce congestion, from the WMCA Congestion Management Plan. Note that 41% of all car journeys in the West Midlands are under 2 miles. From the WMCA Congestion Management Plan, some information about the modal share goals for cycling and the potential for cycling to replace short car journeys. 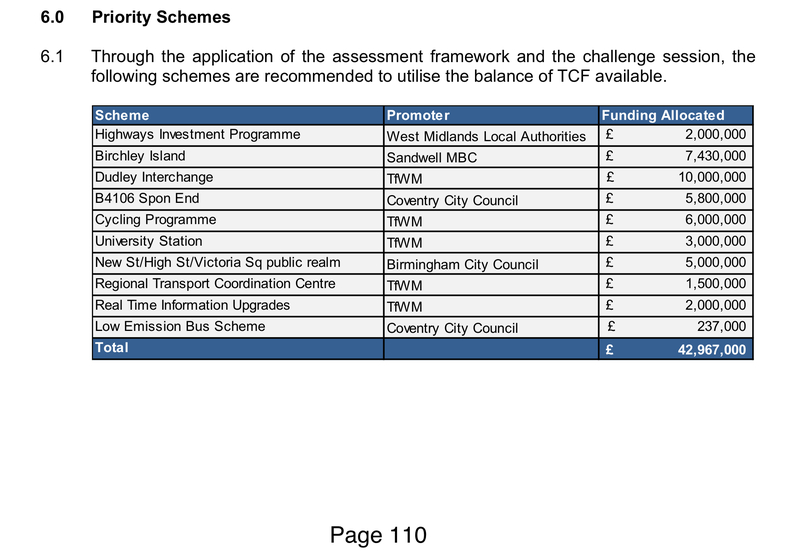 This page from the WMCA Congestion Management Plan shows the various transport schemes that are currently scheduled for the West Midlands, with green dots to represent cycling projects. Note that there are no green dots on that timeline after the middle of 2019 - and these are not schemes that have already got funding allocated. For many of these transport schemes, they have been proposed well before clear plans have been created and funding found. But not cycling schemes - those only appear once funding has emerged. Only cycling is planned reactively, rather than funding being sought actively. Will the Local Walking and Cycling Investment Plan that is being developed by WMCA change that?